has been the leading Apimab Laboratoires brand for over 30 years. Propolia was created thanks to Mr Bernard, the Chairman of Apimab, who has a passion for beekeeping. After discovering Propolis and analysing its benefits, he decided to make products using the "pearls of the beehive", particularly Propolis. Since 1979, Propolia® has been sharing its extensive knowledge of bee products and their benefits for your wellbeing. As French specialists in the transformation of Propolis, we have always been aiming to provide you with the best of natural products. At a time when the promotion of Propolis, Honey and Royal Jelly has, for some brands, become a mere marketing device, we at Propolia®, as we have been for the past almost 40 years, continue the search for new ways to share the benefits of these exceptional substances. Our team of researchers, in tandem with our partners, are working every day to celebrate the extraordinary work of the humble bee as we combine the properties of vegetable and beehive products. 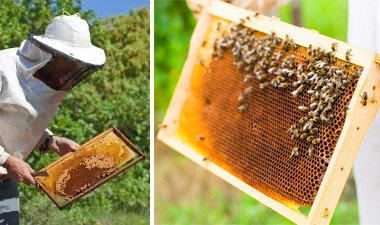 Propolia® is the story of a beekeeper, a simple man who loves his bees. He was convinced that the therapeutic benefits of beehive products went far beyond the wonderful taste of honey. It's the story of a honey house that became a laboratory, continuously improving extraction and purification techniques to produce Propolis products with applications as yet unknown to the general public. It's the story of a brand created in 1979 on the banks of Lake Salagou in Clermont-l’Hérault which has become a leader thanks to its quality products. It's the story of a love of nature, of good things and of craftsmanship. It's the story of a passion..
We are convinced that Propolis and beehive products can help us every day, in many different ways. We built our Propolia® product line based on this belief and on the natural assets of beehive products: from food supplements to cosmetics to personal care products, our formulas combine plant ingredients and beehive products whose effectiveness is boosted by the synergies between their active ingredients. Propolia® has used younger, friendlier graphics since 2013. They reflect our team and the little bee on all of our packaging…a fresh approach that can be seen in the nicknames of our products and in our lively colours which enable our customers to better navigate the product line: each application has its own colour code!